Soccer Village knows when you run onto the field at any given time, it's the most important match you will play all week. From recreational, high school and collegiate teams to various professional teams, Soccer Village's affiliation with soccer across the nation encompasses our passion and commitment to the game. We are extremely proud of our relationships with soccer coaches, players and fans across the country. Some of these relationships include more than 250 elite colleges and high schools in the U.S., as well as the Ohio High School Cup, one of the top high school pre-season tournaments in the nation. The Head Start Program is a program dedicated to developing the sport with inner-city children. At Soccer Village we believe in supporting soccer at all levels of play - whether youth, community, regional or national – which comes from our understanding of the sport and our dedication to the soccer community’s special requirements. By building relationships through customer service, our exclusive Gold Card pricing program for coaches, players and their families, as well as other services, Soccer Village is poised to meet the needs of youth, high school and collegiate players and teams with products and service designed especially for your team's budget, personality and long-term goals. 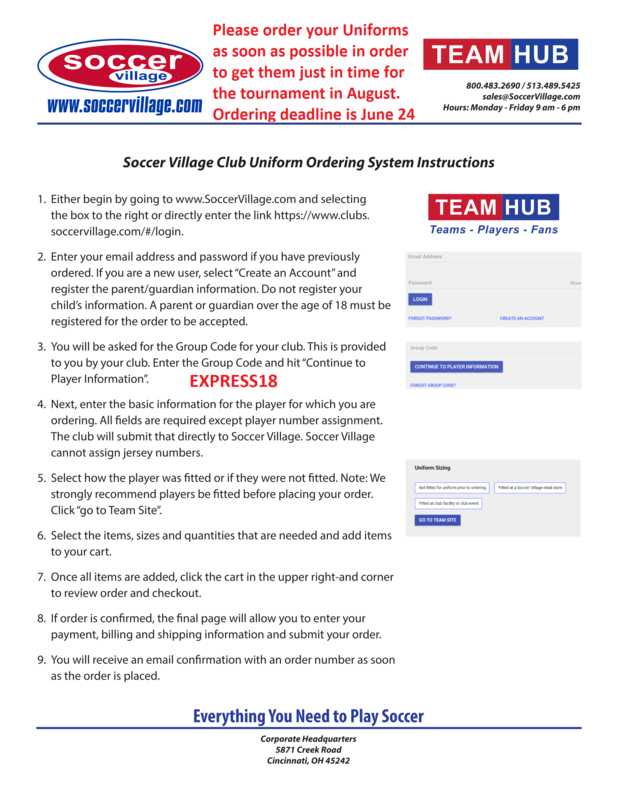 BRIEF HISTORY Since 1984, Soccer Village has grown to one of the nation's largest uniform and equipment retailers, added retail stores and created one of the nations most comprehensive and competitively priced soccer sites on the Internet. SAVE OUR SHOES At Soccer Village we believe there is nothing more important than helping young people participate in the sport. That’s why we ask all our employees to participate in the Soccer Village "Save Our Shoes" program. Last year, the program collected over 1000 shoes and various other equipment for needy soccer players; then the shoes were cleaned, oiled and laced-up and distributed to inner-city youth soccer programs. Ask your sales representative for more information on any of our special programs. We look forward to working with you and your team. We're a family restaurant. And, we believe our family is every member of every community that has a Texas Roadhouse. It is important to give back to the communities that are so much a part of Texas Roadhouse. That means playing an active role in the events that shape the lives of the people we live and work with. That's why you're likely to see Andy the Armadillo at your local little league game or reading to the children in your local schools. That's also why you'll see our Roadies both in the restaurant and out in the community supporting your local charitable organizations, schools, and fundraisers.